Every leader makes mistakes. They cannot be avoided. Major keys to effective leadership are learning from the mistakes made by you and by others and also the ability to handle new situations effectively. Leadership includes setting direction, establishing guidelines, making assessments and decisions, as well as helping an organization get positive results. It also includes personal behaviors, motivating others and developing yourself and others. Many organizations approach leadership by giving an employee a new role and waiting to see if they will “sink or swim”. This is risky in that some very talented people who show great promise are unable to develop themselves quickly enough. So the organization may experience undue stops and starts as they develop, or equally distressing, some very promising people may be replaced, adversely impacting their careers in addition to the lost investment in them and the stress and strain placed on the entire team. This approach is also one of the most expensive ways to develop leaders. 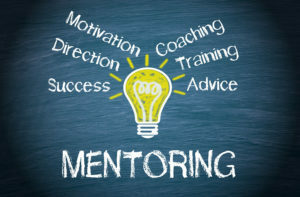 A mentoring program can be highly beneficial to those involved in the program by helping the mentee develop more quickly and more fully, by enabling the mentor to grow through helping another and by enabling the company’s leadership team to become more effective. It also deepens employee loyalty and adds interest and fulfillment to those involved. Leaders at all levels who want to grow and develop benefit from having a mentor. A mentor is a wise and trusted counselor or teacher who is often also an influential senior sponsor or supporter. It is a powerful relationship when properly matched, supported and nurtured. The relationship must be a priority for both the mentor and the mentee and may be formal or informal, although a company sponsored formal program is what is being discussed here. The program may be a single mentoring pair or several. There are some key ingredients to an effective in-house mentoring program. Purpose – the company, the mentor and the mentee should be committed to the process and agree on what will be worked on and how they will know when the objectives have been met. Communication – communication methods should be agreed upon, each party should listen deeply to the other, be open to input and follow through on all commitments. Trust – trust typically grows over time through open and honest discussions, keeping commitments and sharing deeply. Process – an effective process includes a pace that works for both parties, regular meetings, a meeting place both are comfortable with, both parties follow through as agreed, the process includes the four stages of mentoring – planning, building relationship/negotiating agreement, developing and maintaining momentum and ending the formal relationship – and together, the mentorship team moves through them, both parties like how things are going and check in with each other to ensure both are satisfied. Progress – the plans made are followed and progress is made. Interesting learning experiences are identified and results are shared. Progress is made toward established goals. Feedback – positive and corrective advice and feedback is important. In a successful mentoring relationship it is provided, accepted and acted upon and goes in both directions. Companies become more successful by ensuring that they are led by strong, qualified and effective leaders and to understand that leaders grow through a variety of methods. I encourage you to consider each development method listed above, however, the “sink or swim” method is the one I recommend that you avoid at all cost. It is, indeed, the most expensive path.